This is a private museum which covers the history of the Tulip flower in the country. You can come to know about the tulip madness in this country through the multimedia presentation of the whole thing in various LCD screens all throughout the museum. You can enjoy the whole thing and can even buy the bulbs of the most beautiful and existing tulip flowers in the world. You can even see the pictures and read about it in details from the various documents available in the museum. You can visit the place just after visiting the Anne Frank home. You only have to cross a bridge over the canal. You can buy the bulbs of tulip. Visiting the shops that sell the bulbs of tulip is free for the tourists. Time taken to see the place. You can have a family ticket at EUR 15. How popular is Amsterdam Tulip Museum? People normally club together Natura Artis Magistra and Houseboat Museum while planning their visit to Amsterdam Tulip Museum. My wife and I visited the shop and museum. The museum was small, but well done. When I bought tickets for the museum the attendant said it would take about half an hour to go through the museum. We spent closer to an hour and could have spent more time, had we not had other things we needed to do. The geographical and historical background were really interesting. This freaking little place was absolutely adorable. I was museum'd out and thought for sure I would be unimpressed by a Tulip museum, but this place was adorable. So well done for a tiny little place and a simple subject. Only 5 euro to get in per-person - worth it to spend 30min here and support their business. 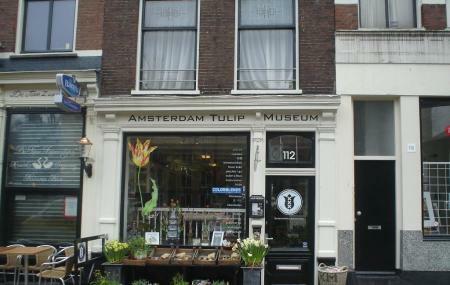 Looks like a small shop from the outside but the tulip history museum extends out back and down stairs. Interesting visit lasted about 1 hour. Nicely stocked shop with gifts and plant bulbs. Nice little museum, with interesting info about the history of tulips in the country and the world. It is small, but nice and tourist friendly although the term museum is a bit too "large" for it.